The Twix.i5 Hybrid Backup battery Dual case for iPhone5/5s is versatile protective case designed for both iPhone 5 and iPhone 5S. Twix.i5 is an innovative two-piece design that includes, a stylish, slim-fitting Snap-on hard shell case to protect your iPhone from bumps and scratches while being truly sporty and stylish, and a backup battery with 2200mAh battery capacity, so you can conveniently charge your iPhone on the go. 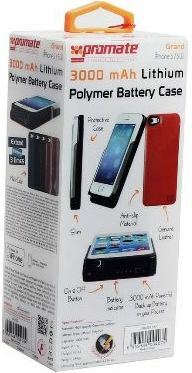 When not in use, you can also detach the battery pack from the protective case in a single click for enhanced portability. Apart from this, Twix.i5 also features a one-touch battery status indicator, an on/off switch to save that extra juice for later and an enhanced audio speaker output. 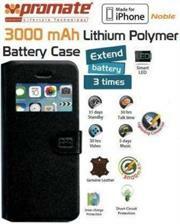 •Rechargeable 2200mAh battery sleeve easily attaches/detaches from the snap case making it highly portable. 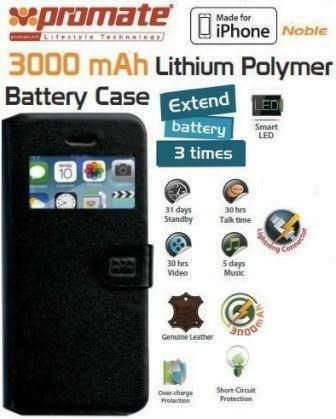 Super Slim Power Case for iPhone 5 -adds 12 hours of talk time, 13 hours of video and and 30 hours of music playback to the regular battery life. ciency at your fingertips. A slim-fitt case with an attractive cutaway back panel designed to protect your iPhone from accidental knocks and scratches whilst discreetly hiding the additional back up battery. This adds 12 hours of talk time, 13 hours of video and and 30 hours of music playback to the regular battery life. Promate noble is an Apple MFI Certified power case made of genuine leather with a powerful Lithium-Polymer Battery for iPhone 5/5S, this is an everlasting enhancement that every iPhone needs. The front flip hosts a convenient window, it is openable like a book and is closed with a convenient magnetic eyelet. The shell, reinforced with transparent plastic, allows a high level of protection against bumps and scratches. The inner part has been built in soft, anti-slip, material to avoid any kind of displacement. The grip, solid and pleasant to touch, gives you a feeling of comfort and strength. The recharging system is controlled by an easy reachable button located on the underside of Grand. Just push the button and you can activate the charging system in which four LEDs allow you to know in every moment of the day the right amount of energy remaining. •Interior made of soft, anti-slip material to prevent displacement and protect your screen from scuffs and scratches. 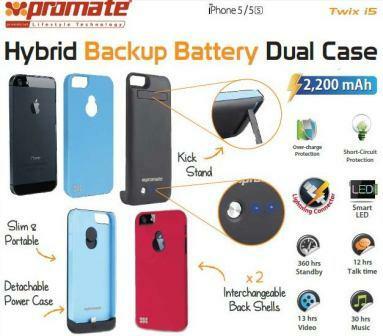 The Promate Grand is an Apple MFI Certified power case made of genuine leather with a powerful Lithium-Polymer Battery for iPhone 5/5s, this is an everlasting enhancement that every iPhone needs. The shell, reinforced with transparent plastic, allows a high level of protection against bumps and scratches. The inner part has been built in soft, anti-slip, material to avoid any kind of displacement. The grip, solid and pleasant to touch, gives you a feeling of comfort and strength. The recharging system is controlled by an easy reachable button located on the underside of Grand. Just push the button and you can activate the charging system in which four LEDs allow you to know in every moment of the day the right amount of energy remaining. •Interior made of soft , anti-slip material to prevent displacement and protect your screen from scuffs and scratches.